At Least 20 Students Injured In Knife Attack At Pa. High School : The Two-Way A 16-year-old is in custody and charged with four counts of attempted murder and 21 counts of aggravated assault over the incident at Franklin Regional High School in Murrysville, near Pittsburgh. Emergency responders gather in the parking lot on the campus of Franklin Regional High School in Murraysville, Pa., on Wednesday after an attack there left at least 20 people, nearly all of them students, injured. Most suffered stab wounds or lacerations. At least 20 teenagers and one adult were injured, two of them critically, Wednesday morning at Franklin Regional High School in Murrysville, Pa., when a 16-year-old fellow student attacked them with two knives. 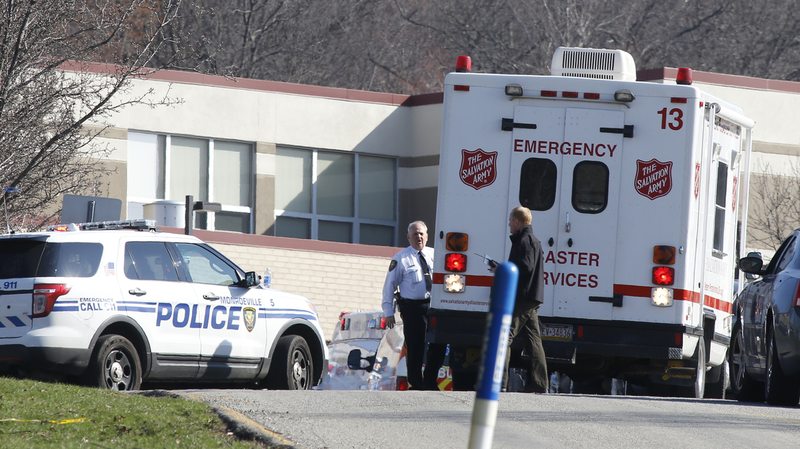 Murrysville Police Chief Thomas Seefeld said during a press briefing that sophomore stabbed students in one wing of the school during a five-minute period. The boy used two "straight knives" measuring 8 to 10 inches. In a charging document, the teenager was identified as Alex Hribal. Not all the students were cut or stabbed. Some are said to have been injured during a rush to get away from the attacker. But authorities said several of the young people suffered stab wounds serious enough to require immediate surgery. Seefeld said police had not received previous calls about the suspect before today, so they are still investigation a motive. Seefeld said the incident came to an end when the school's assistant principal subdued the student with help. The Pittsburgh Post-Gazette reports the student will be charged as an adult. NPR member station WESA is live-blogging the news here. The Post-Gazette says that "the injured students' ages range from 14 to 17." Murrysville is about 20 miles east of Pittsburgh. The incident began shortly after 7 a.m. ET as many students were arriving at the school. Authorities say the first 911 call from the school's resources officer was made at 7:13 a.m. ET. We'll keep an eye on developments and update. As happens when stories such as this are breaking, details are likely to change as the day continues. Authorities now put the number of injured at 22, as WESA reports, though the number of charges against the suspect remains unchanged. The Post-Gazette writes that, "the charges might not reflect all victims, according to Westmoreland County public safety spokesman Dan Stevens." According to a criminal complaint filed with a court in Murrysville, Pa., the boy suspected of stabbing up to 21 people is Alex Hribal. Hribal is charged with four counts of attempted murder; 21 counts of aggravated assault and one count of possessing a weapon on school property. According to an affidavit, Murrysville Police determined that 20 students and 1 officer had been stabbed. Sam King, an assistant principal, told police he saw kids running in the hallway. King told police he saw the aggressor holding two knives and then stab a police officer. "Sam King then tackled the actor and subdued him," the affidavit reads. "Defense attorney Patrick Thomassey described his client as a good student with no criminal record and no history of addiction to drugs or alcohol. He said his client is not a loner and interacts well with other students. "Mr. Thomassey described the incident as 'bizarre' and asked for a mental evaluation to determine whether his client will be competent for an April 30 preliminary hearing." "Teen student charged with 4 counts of attempted homicide, 21 other counts in knife rampage." During a press conference, Pennsylvania Gov. Tom Corbett said this is another "sad day" in this country. He was asked if schools should have metal detectors. "I would hate to say that we need metal detectors in every school," Corbett said. "What [would] it say about our country." The governor was also asked if he was surprised that a knife was used instead of a gun. "It's really about anger," Corbett said. "It doesn't matter what the weapon is." The students he has treated today say they didn't see the person who attacked them, Dr. Timothy VanFleet of the University of Pittsburgh Medical Center just told CNN. They were apparently stabbed or cut while in a crowd. The young man taken into custody at the scene is a 16-year-old sophomore at the high school, Murrysville Police Chief Thomas Seefeld told reporters Wednesday morning. Update at 11:25 a.m. ET. Principal And Resources Officer Tackled Suspect. -- "The suspect was reportedly 'flashing two knives' in the hallway when he was tackled by the school's principal and the school resource officer. Neither was wounded." -- "Twenty people — 19 students and an adult security guard — were injured in the stabbing attack. The guard sustained a stab wound to the abdomen." -- "Investigators don't know at this time what led to the attack." "A doctor says some victims of a multiple stabbing at a high school near Pittsburgh have suffered injuries classified as life-threatening, though all are expected to survive," our colleagues at WESA now report. They're citing information from Dr. Christoph Kaufmann, director of trauma services at Forbes Regional Hospital in Monroeville, Pa.
"Jeff Dahlke with the security company who provides security for Franklin Regional High School tells KDKA-TV that the suspect was armed with two knives.
" 'The alarm went off, and students started rushing outside, the security guard outside rushed in and came upon his supervisor, and a vice principal who had the suspect in custody on the ground and was trying to control him, and try to get the weapons away from him,' Dahlke said. "Police say that security guard was stabbed in the abdomen." Dr. Christoph Kaufmann, director of trauma services at Forbes Regional Hospital in Monroeville, Pa., tells reporters that three of the patients at his facility were being operated on Wednesday morning for "stab wounds of the chest and abdomen. ... These were significant injuries." Other patients, he said, may need "operative care" later today. The Post-Gazette has video of his comments here. "The CEO of Forbes Hospital tells KDKA's Heather Abraham that one student applied pressure to an injured classmate, possibly saving [that] student's life." WESA reports that Dan Stevens, the public safety spokesman, "says the suspect used a knife, though he didn't say what kind or why he attacked the others." County spokesman Stevens says one of those injured was an adult, the Post-Gazette reports.